A Blockchain protocol defining investment transactions between users and the Coinvest smart contracts. Supporting the protocol is the Coinvest DAPP. The Coinvest DAPP, empowers anyone to virtually invest in individual or a curated index of cryptonized assets through one coin. To do so, users create virtual portfolios and trade their favorite cryptocurrencies using market buy, limit buy, sell, and short orders. Orders are executed with the COIN token which are sent and held in escrow by the Coinvest smart contract. The Coinvest DAPP and smart contracts keep track of all investment data including assets, distributions, etc. Upon executing sell orders, the smart contract releases invested funds and any profits back to the Coinvest DAPP. Users can then spend cryptocurrencies directly from the DAPP using their wallet or Coinvest debit account. All transactions and funds are digitally automated by open-source computer code and are never touched or managed by any third-party. Coinvest is creating a future where users have one platform, one wallet, and one token (COIN), that enables anyone to create a digital investment portfolio to invest in multiple cryptocurrencies. Centralized third parties that are often needed in traditional investment use cases are replaced with smart contracts that act as autonomous agents and programmatically compensate all users, investors, and owners within the entire Coinvest ecosystem. Coinvest is offering contributors the opportunity to purchase COIN Tokens at http://coinve.st during its crowdsale this Winter. Raising the crowdsale max cap of $30 million will create two reserves to ensure liquidity and collateral to back all user investments. Additionally, accelerate the development of additional tools to help investors all across the world. Coinvest is the world’s first decentralized stock market for cryptocurrencies. 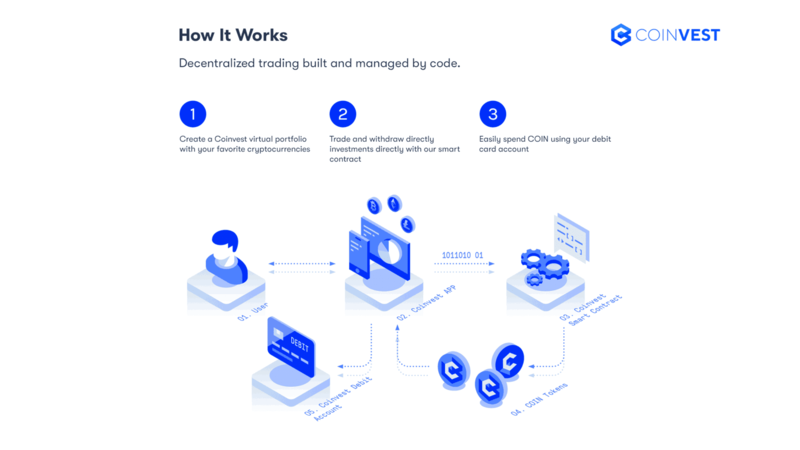 Coinvest empowers anyone to virtually invest in individual or a curated index of cryptonized assets through one coin. The company’s mission is to create decentralized tools for the world to seamlessly, securely, and safely invest and use cryptocurrencies. For more information about Coinvest and COIN token, please visit: http://coinve.st.